Thiem was no match for Nadal on Court Philippe Chatrier, as the Spaniard reached the French Open final. RAFAEL NADAL IS one match away from a historic 10th French Open title after outclassing Dominic Thiem 6-3 6-4 6-0 at Roland Garros on Friday. The ‘King of Clay’ is bidding to become the first man to claim 10 victories at the same grand slam in the Open Era, and his charge showed no sign of abating in a one-sided semi-final on Court Philippe Chatrier. Thiem had seen off defending champion Novak Djokovic to reach the last four but was no match for the magnificent Nadal, who is yet to drop a set at this year’s tournament. Nadal would match his own achievement of a perfect title in 2008 and 2010 if he were to produce another straight-sets triumph against Stan Wawrinka in Sunday’s final. But something will have to give against Wawrinka. Nadal has not lost a Roland Garros final in nine attempts, while Wawrinka is yet to be beaten in a grand slam decider. Thiem was the winner the last time these two met in the quarter-finals of the Internazionali BNL d’Italia and he opened with a break to give himself what would soon become clear was false hope. Nadal, who triumphed in the other two meetings between the pair this year in the finals in Barcelona and Madrid, soon had his opponent sussed. The world number four responded with an immediate break of his own and a forehand between the tramlines from Thiem moved the Spaniard into a 3-1 lead. That came as part of a run of four games on the bounce and an easy hold to love to go 5-2 in front set Nadal up to clinch the opener. The players engaged in some brutal forehand exchanges but Nadal had an answer for almost everything Thiem threw at him – a delightful lob at the start of the second set was evidence of that. Thiem had Nadal briefly on the ropes at 40-15 in the Spaniard’s first service game of the second. Nadal survived that scare and broke in the next, finishing off the set with a hold to love to move one away from the final. Nadal was not giving Thiem the chance to show any of the kind of tennis that saw him storm to a straight-sets win over Djokovic in the last eight and a break in the opening game of the third came as another blow to the Austrian’s fast-disappearing chances of a maiden grand slam final appearance. Thiem and Nadal looked deflated and determined respectively in equal measure and that would be borne out on the scoreboard as the undisputed king of Roland Garros clinched victory with a 6-0 final-set thumping. Email “Clinical Rafael Nadal outclasses Dominic Thiem to reach French Open final”. 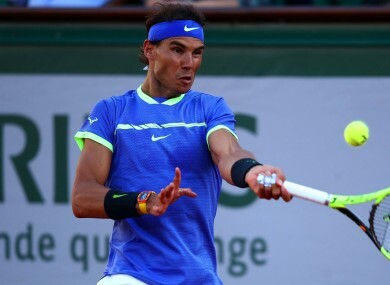 Feedback on “Clinical Rafael Nadal outclasses Dominic Thiem to reach French Open final”.